ASA Certification – Why Certify? 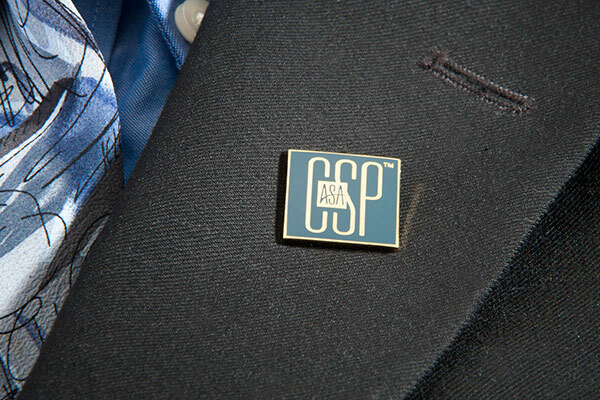 You know earning an ASA credential is the next step for your career growth, and you are ready to move forward with your studies. But first you have to convince your boss. Most bosses are concerned with the return on investment and your time spent on earning a credential. But don’t worry, ASA has you covered. Use these tools and tactics to convince the right person at your company and soon you'll earn the most widely recognized certification in the staffing, recruiting, and workforce solutions industry. Protect the rights of your most valuable asset—your candidates, the temporary and contract employees you put to work every day. Your candidates want to experience the best possible relationship with your firm. Protect your staffing firm, your employer, and your team—by being familiar enough with the law to recognize red, and maybe even yellow flags and know that these may be issues to consider-and perhaps to discuss with legal counsel. Protect your client—by acting as not just a staffing firm, but as a partner that will protect the client's interest, from a legal perspective. ASA often hears about the commoditization of the staffing industry. One way to overcome this perception is to differentiate your firm from the competition by emphasizing its ability to recognize what joint and co-employment mean in any context. Learn about the legalities of protecting your business. "You want to work with my firm because we have nationally certified professionals who look out for your interest, we know the law, and we can show you how it applies to your firm and keep everyone out of trouble. We are true partners that look out for your interests." What you learn from studying for and passing the exam to earn an ASA credential will ultimately help you guide your firm. Not only will you develop yourself professionally, you also will be using what you learn to improve your firm's bottom line. ASA-certified professionals are part of an elite community of industry professionals who add value to their client relationships, make their companies more competitive, and raise the professionalism and expertise of the industry. Industry-leading education from ASA includes webinars, conference sessions, employment law textbooks, and premium materials that ensure you are learning the most up-to-date information about the most relevant topics. You'll also enhance your employment law knowledge thanks to the expertise of the ASA legal team, some of the top attorneys in the industry. Staying up-to-date and knowing the laws in your profession is hard work. You have to be an expert in your specialty and know how to keep your firm ahead of the competition. Show co-workers, talent, clients, and your industry that you have the credentials to be a well trusted and skillful staffing professional. 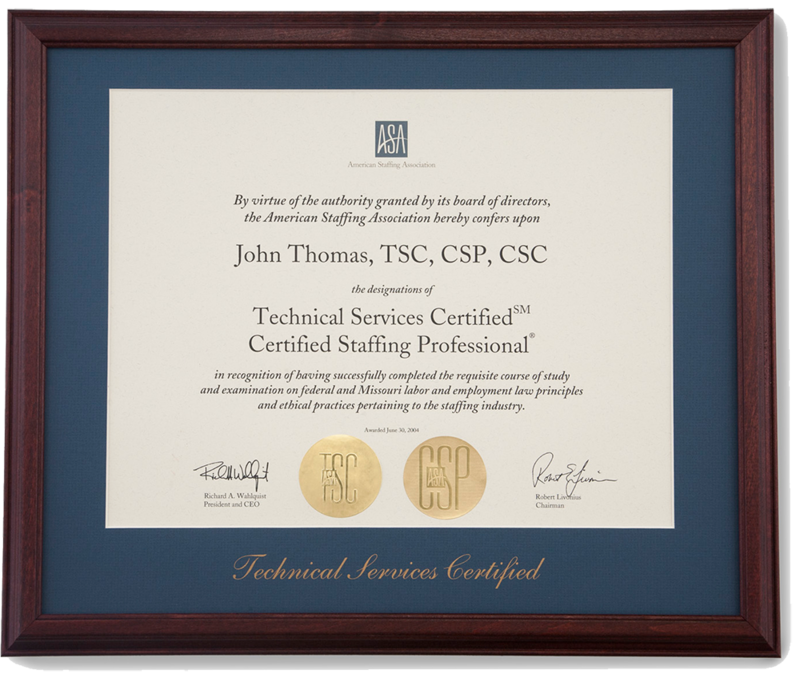 For these reasons, there’s no better time to earn the Certified Staffing Professional, Technical Services Certified, Certified Search Consultant, and/or Certified Health Care Staffing Professional credential from ASA. More than 9,500 professionals in the staffing, recruiting, and workforce solutions industry have already earned ASA credentials—it’s time for you to join the industry elite. These videos show the value of ASA certification. Share them with your boss and colleagues to demonstrate the importance and benefits of earning an ASA credential. —Maureen Heisinger, TSC, CSP, Day & Zimmermann Group Inc.
Once you earn your credential, participate in these ASA events to earn continuing education hours that count toward maintaining it. As an employee of an ASA member company, you have access to all ASA webinars and on-demand recordings for free.